Vortex Performance - Leaders and innovators of Programmable Ignition products to the Off Road world entered the EFI (Electronic Fuel Injection) arena with a Robust, Small and easy to use EFI solution specifically designed for low cost Off Road applications. 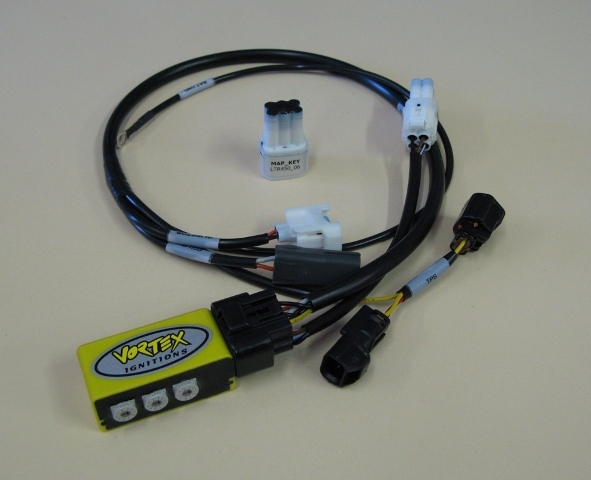 The EFI Interceptor is designed to work in conjunction with the standard ECU of the EFI ATV. These EFI engines use what is known as open loop systems, meaning they have no lambda or wideband air fuel sensor in the exhaust to detect changes in flow through the motor. When the airbox lid is removed and /or an aftermarket pipe is added increasing the flow through the motor the standard ECU cannot adjust the fuel to correctly compensate for best performance. The EFI Interceptor piggybacks between the fuel injector and the standard ECU and also connects to the TPS (Throttle Position Sensor) to adjust the AIR/FUEL ratio according to RPM and Load for Maximum Power and Drive. The EFI Interceptor is supplied pre programmed with a fuel map suitable for use with these basic performance enhancements of Pipe and Airbox mods. In addition, there are three switches which allow the user to fine tune the fuel mapping in a similar way they used to change pilot, needle and main jets on a carburetted machine. The three switches represent throttle openings from SWITCH 1- [5-33%], 2-[34-66%] 3-[ 67-100%] and allow the user to adjust the pre programmed fuel map by an additional +8% or - 8%. These switches are so easy to use and provide immediate feedback of position when tuning or track testing. Pre Programmed with 1 Performance Fuel maps - all the work is done for you! Adjustments require only a screwdriver and integrated switches provide visual feedback. All Vortex EFI Interceptors are factory programmed with Performance Fuel Maps developed through extensive dyno and track testing by Vortex Ignitions engineers with our network of race teams worldwide.